Charlton owner Roland Duchatelet has refused to sanction a move for former Pompey striker Joe Mason. He left Molineux just weeks after his deal with Kenny Jackett’s side expired. Plymouth have also been linked with the 27-year-old, but it appeared Charlton would be his most likely destination. However. Lee Bowyer’s hopes of adding him to his squad appear over after Duchatelet said no to a potential deal. And that’s despite the Addicks banking at least £1.5million from the recent sale of Karlan Grant to Huddersfield. Speaking to the the South London Press, Bowyer said: ‘He (Mason) is the one that we were looking to bring in. 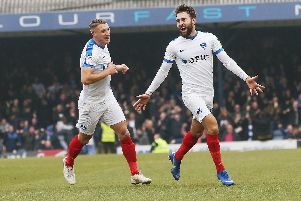 Mason played four times for Pompey this season but failed to score. He returned to then parent club Wolves at the start of January.